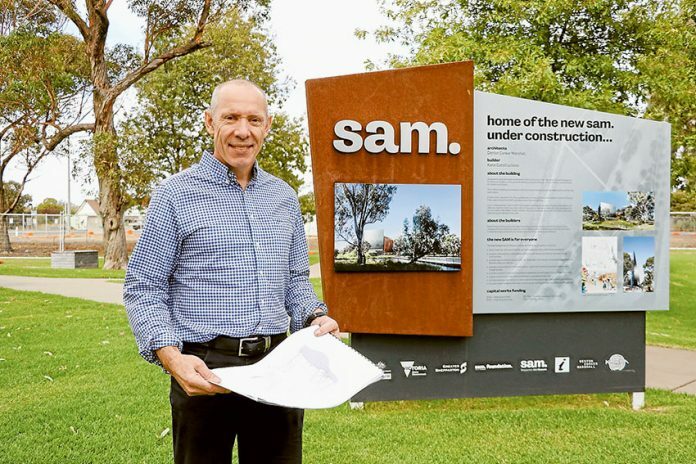 PREPARATIONS BEGIN FOR NEW SAM… Shepparton Art Museum (SAM) Foundation chair, SAM Ltd board member and project board member, John Head at the site for the new SAM on the foreshore of Victoria Park Lake, where works began last Friday. Photo: Katelyn Morse. EXCITEMENT is building following ground being broken at the new Shepparton Art Museum (SAM) site on the Victoria Park Lake foreshore on Friday last week, which has marked the start of construction for the $47M state-of-the-art museum. The construction will take place over two stages with stage one seeing the piles completed and ground floor slab laid by mid 2019, the level four slab and roof structure completed by late 2019, façade completed by early 2020 and fit-out completed by mid 2020. Stage two will be completed by late 2020 and includes landscaping and completion of the car parking space. The works will also necessitate the removal of 37 trees in the footprint of the SAM building, with council replacing the trees with 35,000 tube stock trees, 31 medium (45 litre) trees and 46 large (100 litre) trees to offset the loss. Successful tenderer for the build, Kane Constructions Pty Ltd signed the contract with Greater Shepparton City Council, signalling the start of the build. Kane Construction director, Geoff Purcell said, “Kane is very excited to be appointed to construct this unique and special project. Greater Shepparton City Council Mayor, Cr Kim O’Keeffe said, “This is the most significant and bold building that council has invested in, and we have every confidence that Kane Constructions will do the design justice. 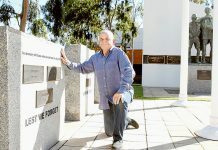 Shepparton Art Museum (SAM) Foundation chair, SAM Ltd board member and project board member, John Head said, “It is good to see that council has made the decision to move forward with the build. I’m excited to see works progressing. “There are a lot of committed people involved in the project and many who are sponsoring the project.